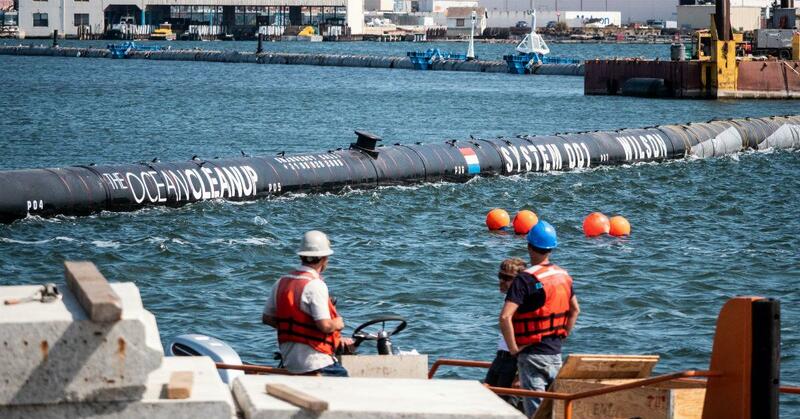 The Ocean Cleanup is finally ready to set sail on its maiden voyage. After several weeks of testing, the 2,000-foot-long system is heading to the Great Pacific Garbage Patch, where it will begin hacking away at the massive floating trash heap. The Ocean Cleanup officially launched System 001 on Saturday, September 8 in a much-hyped ceremony at the San Francisco Bay. A boat towed the collection of tubes 240 nautical miles offshore into the Pacific Ocean to prepare for assembly and a series of tests. The company posted the results of the "Pacific Trials" on Friday, October 5 — and it appears the Ocean Cleanup is ready for action. The Ocean Cleanup is the work of Boyan Slat, a 24-year-old Dutch entrepreneur. Slat was inspired to fight ocean pollution after a visit to Greece when he was still a teenager. He was shocked to see so much plastic clogging the seas, and set out to invent a solution. He landed on an enormous series of tubes, which float in a curved U-shape. The tubes have a 10ft “skirt,” or screen, attached to the bottom that traps plastic debris in its path. 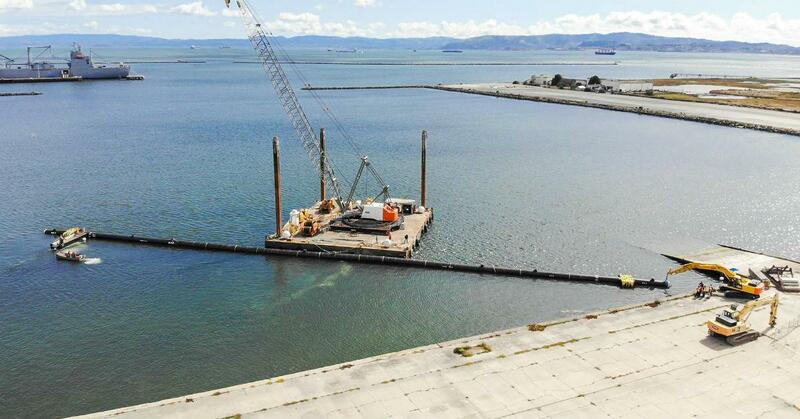 Together, they make up the larger Ocean Cleanup system. The Ocean Cleanup was designed to tackle the Great Pacific Garbage Patch, the gigantic chunk of plastic waste that’s been bobbing between California and Hawaii since at least the 1980s. While its exact dimensions are unknown, scientists estimate it’s at least the size of Texas. The journey to the Great Pacific Garbage Patch will take another 2-3 weeks. But once the Ocean Cleanup arrives, it will start collecting plastic with its large screen, bringing the first haul back to San Francisco a few months later. Once this trash is cleared, the vessel will return for more. The Ocean Cleanup believes it can extract 50 tons of plastic per year with this system, but it has plans to deploy multiple vessels — ultimately, 60. Together, the full fleet could remove up to 14,000 tons of plastic and 50 percent of the trash in the Great Pacific Garbage Patch every five years. Skeptics have raised concerns that the system will harm marine animals, who could become trapped in the screen. But the Ocean Cleanup insists it will only trap plastic. The company has worked with organizations like the National Oceanic and Atmospheric Administration (NOAA) to develop a fish-friendly system that moves slow enough for active animals to swim out of the way and guides immobile creatures underneath the screen with the current. 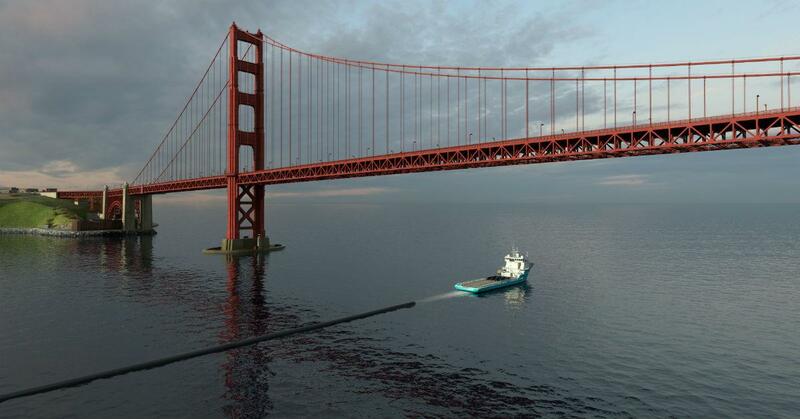 Computer rendering of the Ocean Cleanup tubing being towed under the Golden Gate Bridge. The system had already been through multiple tests and prototypes prior to the Pacific Trials, all aided by $30 million in funding. Now, Slat and the rest of the crew are excited to see their model in action. “The cleanup of the world’s oceans is just around the corner,” Slat said in a previous press release. “Due to our attitude of ‘testing to learn’ until the technology is proven, I am confident that – with our expert partners — we will succeed in our mission."